If you’re looking for some serious bites on your line, paying attention to the time of day you’re casting off may be your key to success. Fishing at certain times of the day have proven to be better and more successful for fishermen, depending on their location and the types of fish they’re trying to catch. The experts at FishingLicense.org recommend all serious fishermen to study their target species of fish to determine when they’re most active, and plan their outing around that schedule. If you plan your fishing trip around when the fish are most active, it can make for a more exciting and positive experience. Here are a few times of day that are commonly known to lead to more fresh catches. Fish aren’t big fans of the bright sunlight. The early morning dawn hours give off a beautiful glow that isn’t too bright for them. Most fish are more active in these early dawn hours because they find it easier to feed. According to the team at FishingLicense.org, these active early morning dawn hours can vary depending on your location, but mostly will be from 6 a.m. to 9 a.m. The season you’re fishing in will also affect the activity of your local fish in these early morning hours. When it’s extremely hot or cold outside, you’ll find less activity among all species of fish. All fish are cold-blooded, and extreme temperatures can lead to less oxygen in the water, which can make fish less likely to move about freely. If the temperature seems to be steady, however, you can bet that these early mornings will be a great time to cast off. While it can be tough to motivate yourself to get up early, especially on a day off from work, it’ll be worth your while. An early morning fishing trip filled with fresh catches and exciting reel-ins is always worth setting the alarm for. If you’re not a fan of waking up early, the late morning won’t be a total wash for a fishing trip. While fish aren’t as active as the early morning hours, you can still catch them in deeper waters during the warmer months. To stay away from the bright light of midday, fish will generally drift to these deeper waters from 9 a.m. to 1 p.m. In the springtime, this time of day will give you access to fish if you’re casting off in the downwind shoreline. In the cooler fall months, fish are ignoring the bright sunlight in favor of warmer water. They’ll venture into shallow waters to stay warm, so you can look for them there if you’re out around this time of day. The team of experts at FishingLicense.org recommends paying attention to the heat and sun during this time of day. The sun’s rays are extremely strong in the middle of the day and it’s important to have sun protection at all times if you’re out in the late morning and afternoon hours. Like the early morning hours, fish are extremely active in the dusk time. The sun is starting to lower, making that bright light diminish. During these hours, fish get hungry and start to search for food out in the open surfaces of the water. The sun is directly overhead while it lowers, so the water itself is much warmer and it’s a more inviting environment for fish to move about in. Fish who were spending the peak of their day in the depths of the water will often come up closer to the surface to feed and stay warmer. 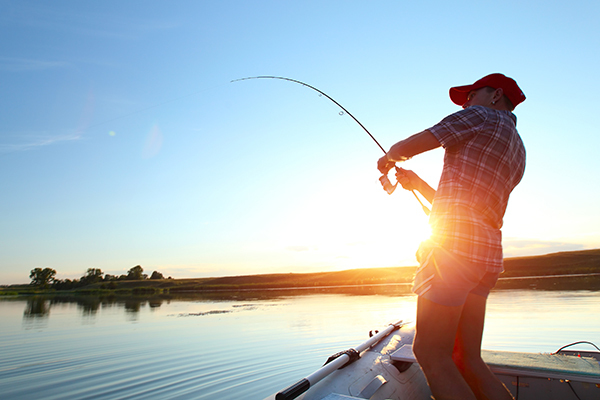 According to the team at FishingLicense.org, fishing from 2 p.m. to sundown can be successful because of the vigorous activity fish exude during these hours. Not only will you have a bunch of fresh catches during these hours, you may also get to experience a beautiful sunset out on the water if you choose dusk for the timing of your outing.